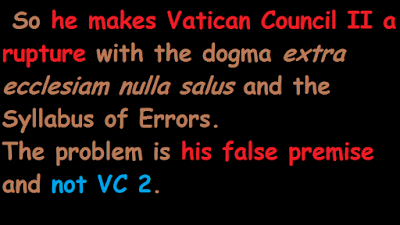 They reject the dogma extra ecclesiam nulla salus when they use a false premise. 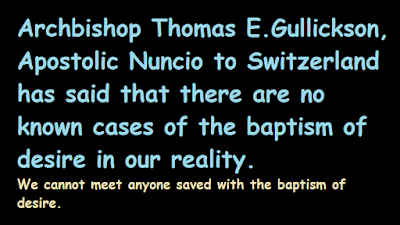 Extra Ecclesiam Nulla Salus ( with the false premise).It refers to the dogma but with exceptions.All do not need to defacto convert into the Church in the present times, since there are exceptions.The baptism of desire( with the premise), baptism of blood( with the premise) and being saved in invincible ignorance( with the premise) are exceptions to dogma as it was known to the missionaries in the 16th century. 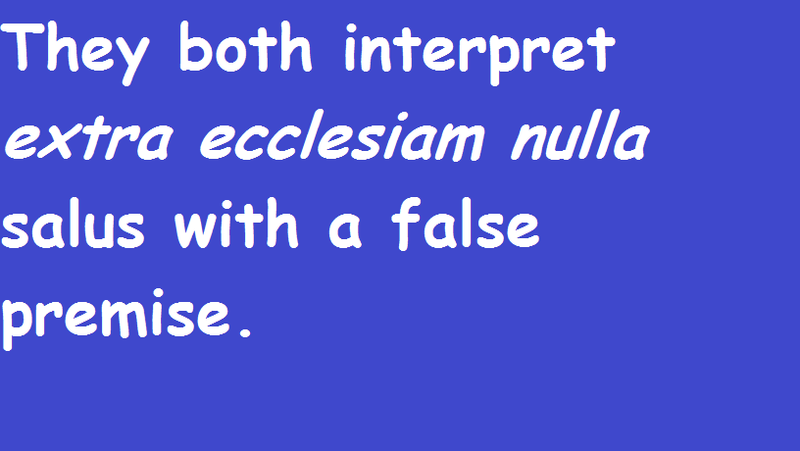 Extra Ecclesiam Nulla Salus ( premise-free): It refers to the dogma as it was interpreted over the centuries.There are no known exceptions to all needing to formally enter the Church, with faith and baptism, to avoid Hell.Invisible for us baptism of desire, baptism of blood and being saved in invincible ignorance are not visible exceptions to all needing to be incorporated into the Catholic Church for salvation. 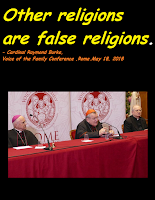 The Magisterium and the traditionalists ( except for the St.benedict centers) in general use the false premise. This is heresy. 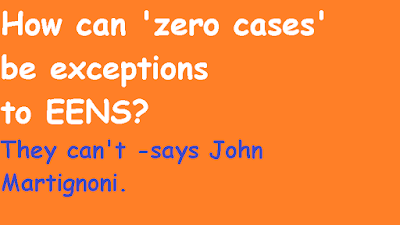 They also violate the Principle of Non Contradiction. 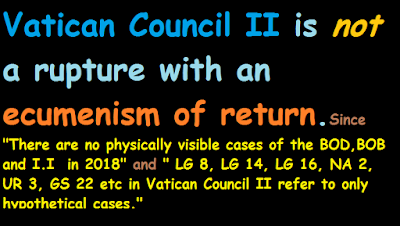 They then interpret Vatican Council II also with a false premise.So the Council is a rupture with the dogma extra ecclesiam nulla salus(premise-free). 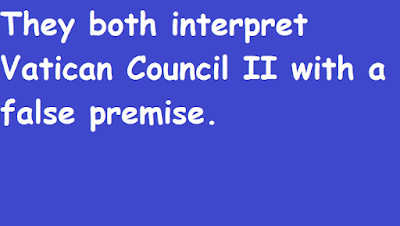 Vatican Council II (with the premise): It refers to the interpretation of Vatican Council II without the false premise.LG 16, LG 8, UR 3, NA 2 etc refer not to hypothetical but known cases in the present times. 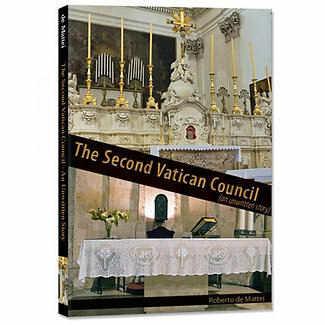 So Vatican Council II emerges as a break with the dogma EENS. 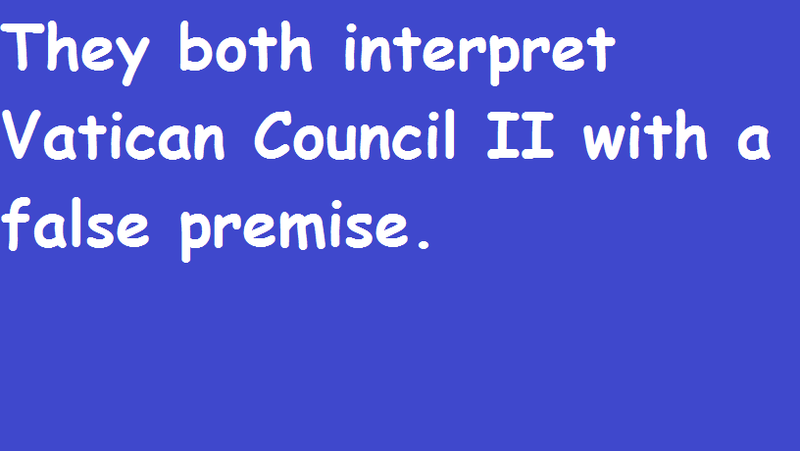 Vatican Council II ( premise-free):It refers to the interpretation of Vatican Council II without the false premise.LG 16, LG 8, UR 3, NA 2 etc refer to hypothetical cases, which are unknown personally in the present times.So Vatican Council II is not a break with EENS, the Syllabus of Errors, ecumenism of return, the Nicene Creed ( premise-free),the teaching on the Social Reign of Christ the King over all political legislation and the non separation of Church and State( since all need to convert into the Church to avoid Hell). 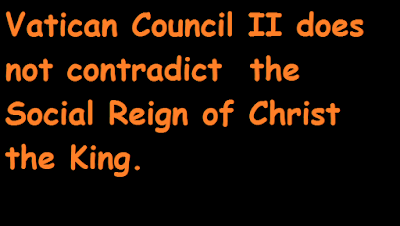 Again they are in heresy and violate the Principle of Non Contradiction with reference to Vatican Council II as they do for EENS. 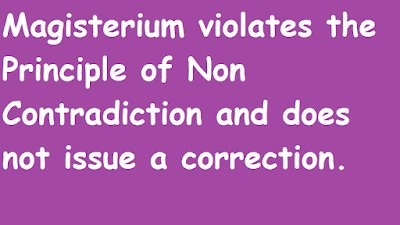 This is a common mistake made by them. 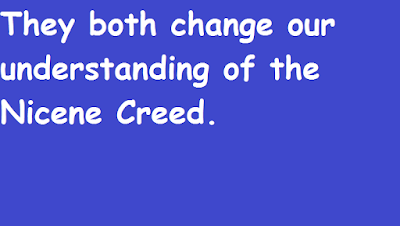 They then re-interpret the Nicene Creed with the false premise.This is first class heresy. Nicene Creed ( with the false premise): It says 'I believe in one baptism for the forgiveness of sins' and means there are more than three known baptisms.They are baptisms of desire, blood and invincible ignorance, all excluding the baptism of water.Then there is salvation mentioned for them in LG 8, LG 14, LG 16, UR 3, NA 2, GS 22 etc all without the baptism of water.So it no more is 'I believe in one baptism for the forgiveness of sins'. 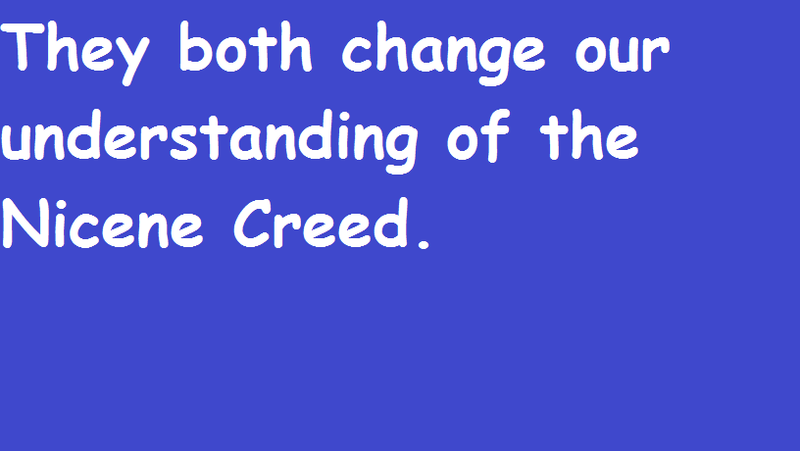 Nicene Creed ( premise-free): It says 'I believe in one baptism for the forgiveness of sins and means there is one known baptism the baptism of water. 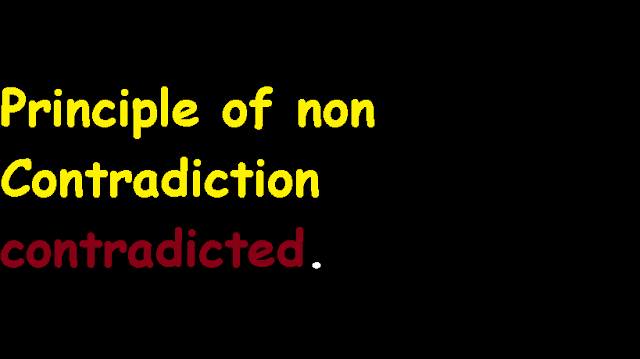 With the false premise they violate the Principle of Non Conradiction. 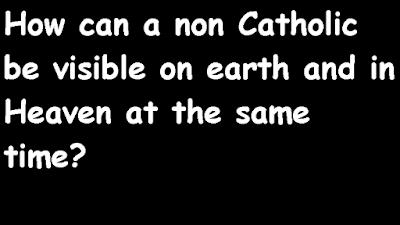 Then they apply it to EENS, Vatican Council II and the Nicene Creed. 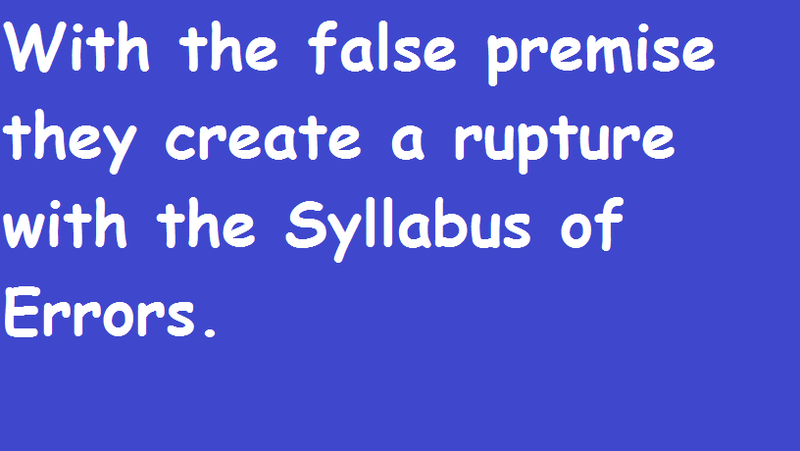 4.THEY INTERPRET MOST MAGISTERIAL DOCUMENTS WITH THE FALSE PREMISE TO CREATE A RUPTURE WITH TRADTION. 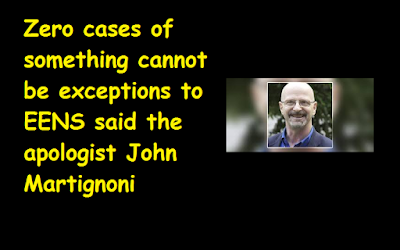 They interpret all magisterial documents using a false premise ( invisible people are visible, unknown non Catholics are known) which creates a rupture with the old exclusivist excclesiology of the Church(Unknown non Catholics saved outside the Church are practical exceptions to the past ecclesiology). 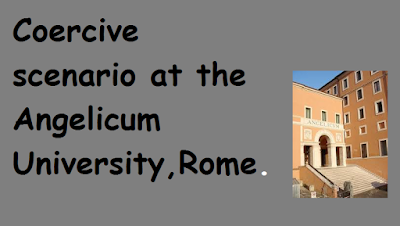 This is a magisterium gone wrong. 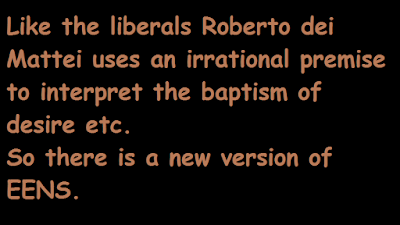 So they use the false premise to interpet the Catechisms when they refer to the baptism of desire(BOD), baptism of blood(BOB) and I.I(I.I). 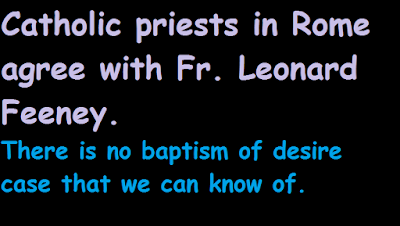 So they assume that the Catechisms of Pius X, Trent and Baltimore refer to visible instead of invisible cases of BOD, BOB and I.I. Since they are not hypothetical for them, it is assumed that they contradict the Feeneyite interpretation of the dogma EENS. Similarly with the false premise they make the Syllabus of Errors obsolete.With there being known salvation outside the Church for them there is the theological opening for the New Ecumenism. 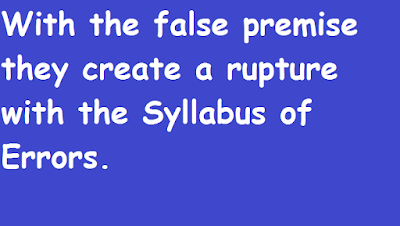 The Ecumenism of Return of the Syllabus of Errors is made obsolete with the false premise and inference. 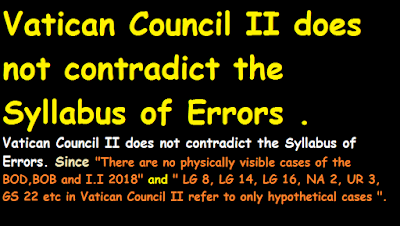 The error is already there in the text of the Letter of the Holy Office 1949 and so they simply repeat it.The Council Fathers also repeated this error in Vatican Council II. 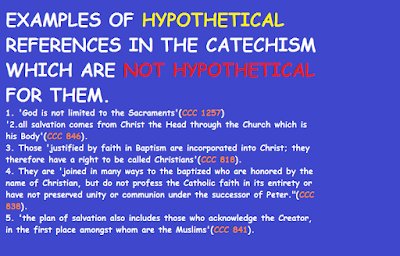 HERE ARE EXAMPLES OF THE HYPOTHETICAL REFERENCES IN THE CATECHISM WHICH FOR THEM ARE NOT HYPOTHETICAL. THEY ARE HYPOTHETICAL FOR ME. 1. 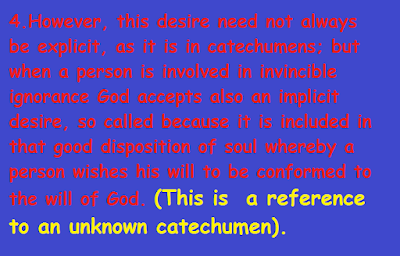 'God is not limited to the Sacraments'(CCC 1257). 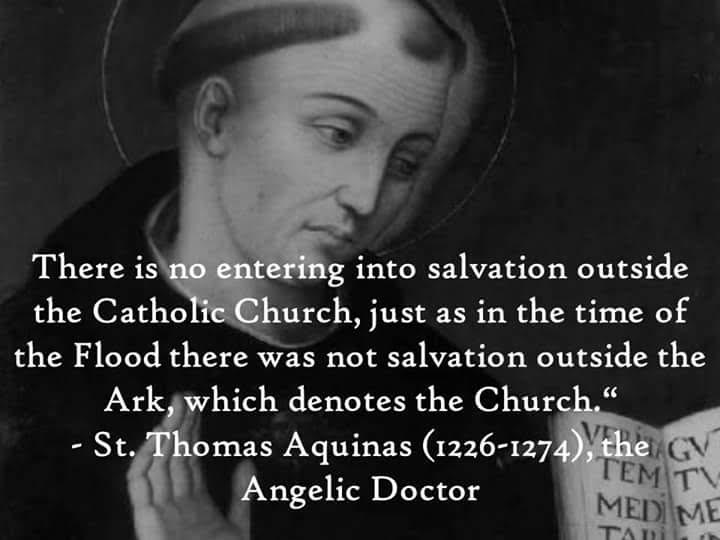 '2.all salvation comes from Christ the Head through the Church which is his Body'(CC(CCC 846). 3. 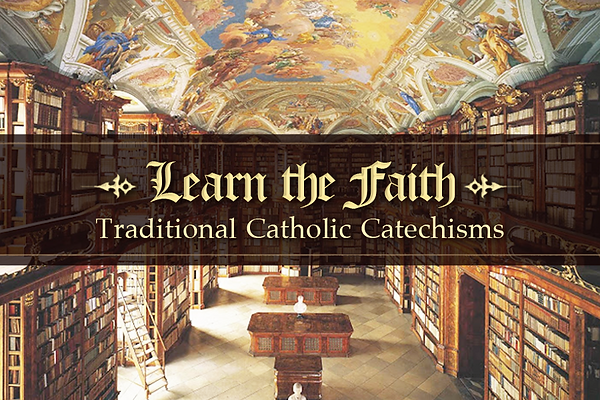 Those 'justified by faith in Baptism are incorporated into Christ; they therefore have a right to be called Christians'(CCC 818). 4. 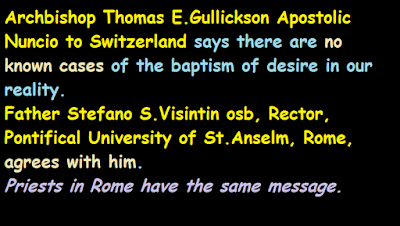 They are 'joined in many ways to the baptized who are honored by the name of Christian, but do not profess the Catholic faith in its entirety or have not preserved unity or communion under the successor of Peter. "(CCC 838). 5. 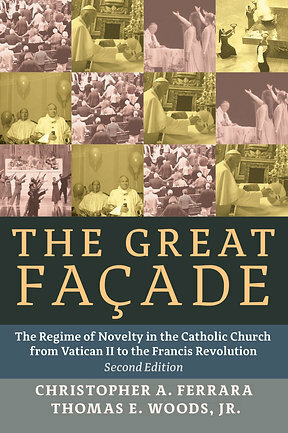 'the plan of salvation also includes those who acknowledge the Creator, in the first place amongst whom are the Muslims'(CCC 841). 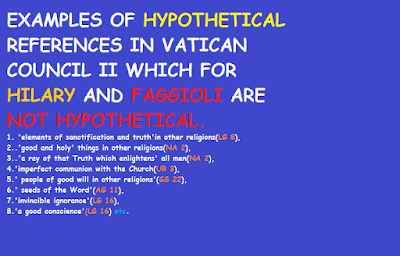 EXAMPLES OF HYPOTHETICAL REFERENCES IN VATICAN COUNCIL II WHICH FOR THEM ARE NOT HYPOTHETICAL.THEY ARE HYPOTHETICAL FOR ME. 1. 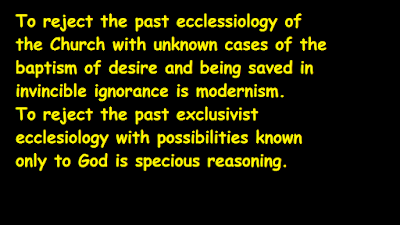 'elements of sanctification and truth'in other religions(LG 8). 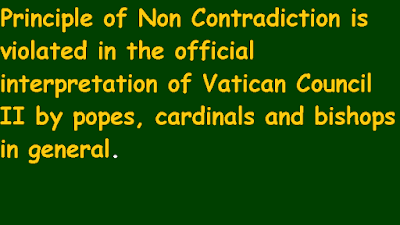 2..'good and holy' things in other religions(NA 2). 3..'a ray of that Truth which enlightens' all men(NA 2). 4. 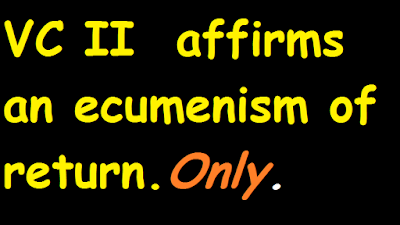 'imperfect communion with the Church(UR 3). 5.' 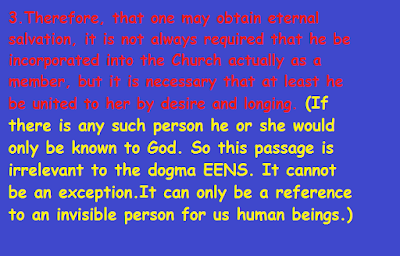 people of good will in other religions'(GS 22). 6.' 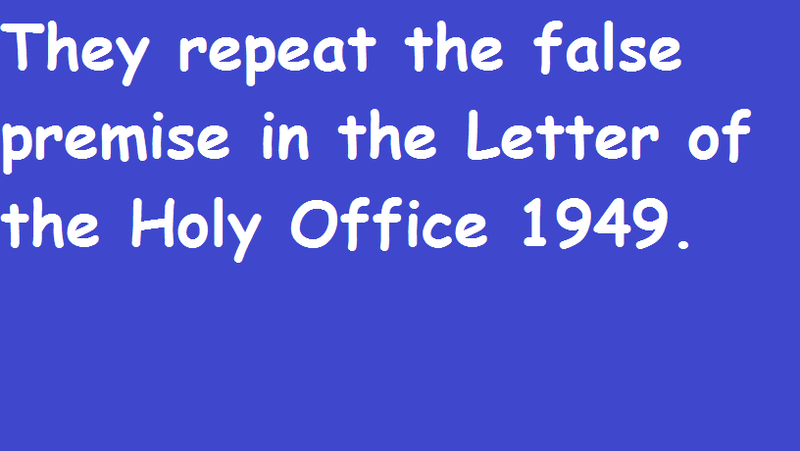 seeds of the Word'(AG 11). 8. 'a good conscience'(LG 16) etc. 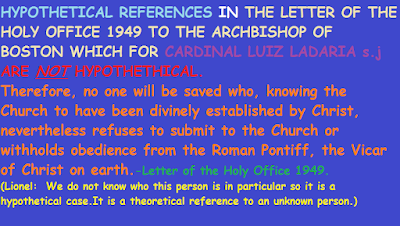 HYPOTHETICAL REFERENCES IN THE LETTER OF THE HOLY OFFICE 1949 TO THE ARCHBISHOP OF BOSTON WHICH FOR THEM ARE NOT HYPOTHETICAL AND SO ARE EXCEPTIONS TO EXTRA ECCLESIAM NULLA SALUS. 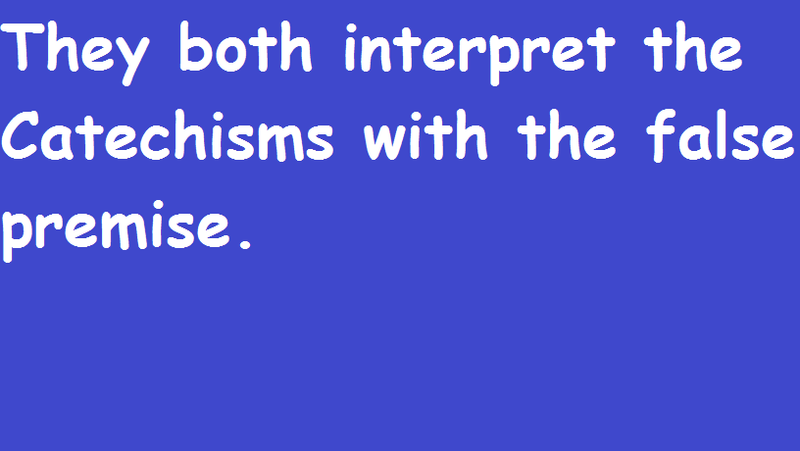 THEY ARE HYPOTHETICAL FOR ME. 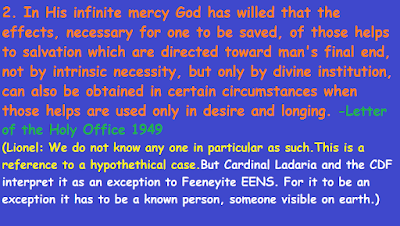 2.In His infinite mercy God has willed that the effects, necessary for one to be saved, of those helps to salvation which are directed toward man's final end, not by intrinsic necessity, but only by divine institution, can also be obtained in certain circumstances when those helps are used only in desire and longing. 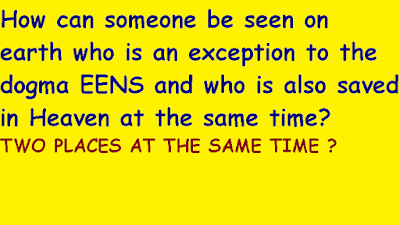 (we do not know any one in particular as such so this is a hypothetical case). 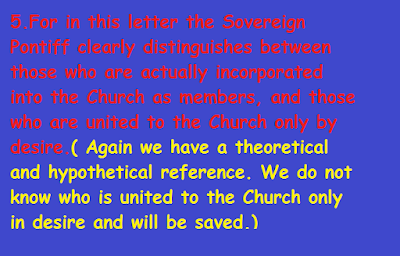 5.For in this letter the Sovereign Pontiff clearly distinguishes between those who are actually incorporated into the Church as members, and those who are united to the Church only by desire. 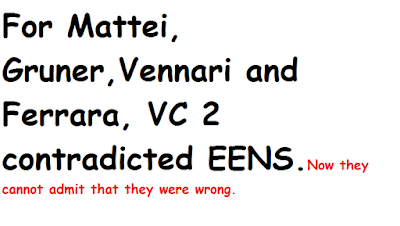 ( and we do not know any in particular.So this is a theoretical and hypothetical reference).